ENTRIES FOR THIS GIVEAWAY ARE CLOSED. THE WINNER WILL BE ANNOUNCED TOMORROW (MARCH 4TH). I love the idea of steeping your soul. I got the idea (as a matter of fact) from watching the Oprah Winfrey show one day. To steep your soul means to nourish yourself, to do what you love, to allow your blessings, and to connect with your goodness. There is nothing that I love more than to create beautiful things. It is, in fact, one of the ways that I steep my soul. 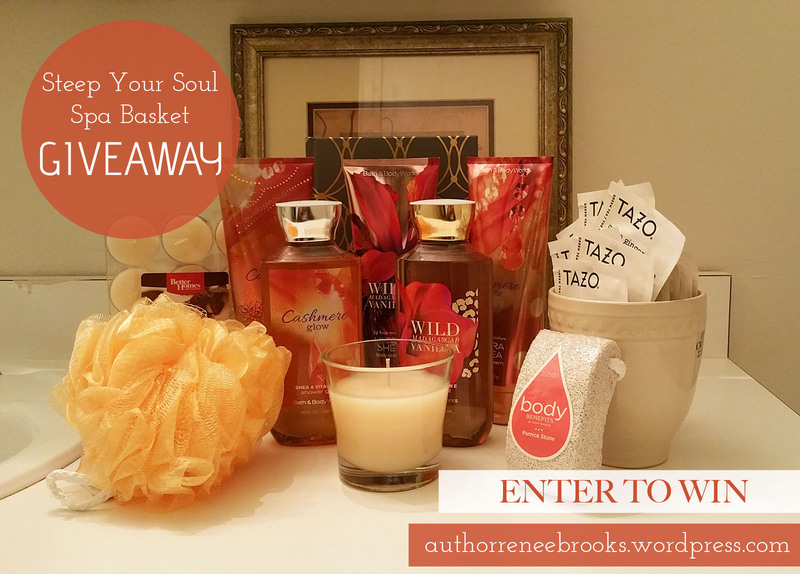 So I thought, wouldn’t it be nice to create something beautiful, and surprise someone special with a wonderful gift… I am so excited to announce my very first giveaway – The Steep Your Soul Spa Basket Giveaway! You must subscribe to the authorreneebrooks.wordpress.com blog to enter. This can be done by locating the follow button at the bottom right or top right of the page, and entering your email address to follow the blog. Entries for this giveaway will open on February 4th, 2015 @ 10am EST. Entries for this giveaway will close on March 3rd, 2015 @ 5pm EST. There is only one entry allowed per person. You must refer a friend to enter. 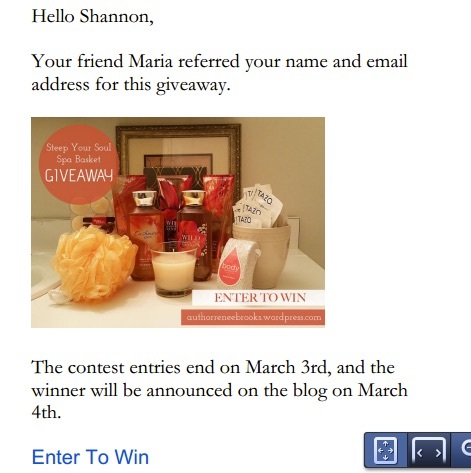 Your friend will receive this “invitation to enter” email. Click the follow button on the side menu to follow the authorreneebrooks.wordpress.com blog via your WordPress account or your email address. Read the complete list of terms and conditions. Scroll down to view a more detailed description of what I’m giving away. Fill out the entry form at the end of the post to complete your entry. After your entry is submitted, you will receive a confirmation email acknowledging your submission from the authorreneebrooks@gmail.com email address. If there is an issue with your submission you will be notified via email. The winner will be announced on the blog on March 4th, 2015. After the winner is announced, a congratulations email will be sent to the winner. The winner has 48 hours to respond to the email notification to claim their prize. If the winner does not respond within 48 hours, the winner forfeits the prize, and another winner will be selected at random. The same 48 hour period and forfeit rules will apply, until a winner claims the prize. Thanks for entering the contest! Since you’re here… why not take a look around and see if there’s anything that inspires you? Here are some of my recent posts. I Sense Overwhelm – How Many Roles Are Crying Out For Your Attention? If you like this post, don’t forget to hit like, comment, and share.